You think that monstrous hand-me-down Dell laptop you used in college was old? Kyocera’s TRS-80 Model 100 dates all the way back to 1983. It’s considered to be one of the first true laptops. So obviously someone resurrected and hacked one to surf the internet. The glutton for punishment in this case is Ars Technica’s Sean Gallagher, who successfully revived a Radio Shack-branded TRS-80 (which boasted a whopping 24KB, or 0.000024GB, of RAM). 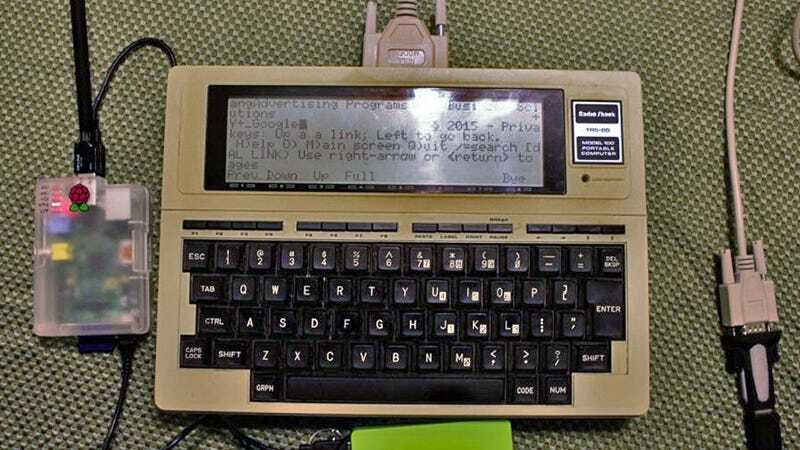 The laptop predates the internet—at least as we know it—by decades, so Gallagher spent a week wiring up custom serial cables, making the TRS-80 interface with a Raspberry Pi, and whipping up some custom code. The results are just about the worst web surfing experience you could ever imagine, even worse than Wi-Fi on a plane. There’s no photos, no videos, no animated GIFs. That said, the TRS-80 did run for a full 20 hours on just four AA batteries, so maybe modern smartphone makers can look to it for inspiration after all.